Joy has lived in Billericay since 1971, however like many people she still remembers Laindon with great affection. The family moved to Laindon in 1953, it was a lot different to how it is today. 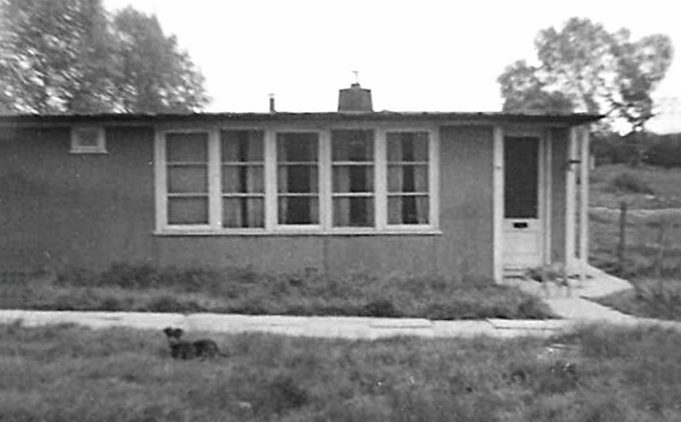 My parents, sister, four brothers and myself left a three roomed bungalow in Pitsea and moved into a four roomed prefab in Victoria Road. We had a bathroom and a flush toilet for the first time, plenty of cupboards in the kitchen and a hot water heater. The bungalow we had left and spent our early childhood in only had a Butler sink in the kitchen with no main drainage. So to suddenly have these “mod cons” was wonderful! At that time Devonshire Road was unmade from Powell Road to Victoria Road. There were some bungalows on the right hand side of Devonshire Road but the left hand plots only contained the remains of bungalows that had been abandoned before we moved into the area. There were numerous fruit trees and the ruins of old sheds in the gardens and for some of the time, this was our playground. Manor Park was about a minutes walk away and we spent a lot of time there. We had much more freedom then than children have today, or even when our own children were growing up. We would walk down the unmade part of Victoria Road to the ‘Lily Pond’, where we would try to catch little fish that could be found there – it seemed a long walk in those days. One of the things that were different to Pitsea was the amount of shops along the High Road that stretched from the ‘Fortune of War’ (this well known Public House was a favourite stopping place for coachloads of Londoners, en-route for a day in Southend-on-Sea. Sadly it no longer exists and has been replaced by yet another development of flats and houses on the A127 Arterial Road, opposite McDonalds) to Laindon railway station. Further shops could be found in Langdon Hills High Road that continued south of the railway and were strung out on both sides of the road as far as Samuel Road. There was a parade of shops a little further along just before Langdon Hills Primary School on the east side of the High Road, known as Nightingale Parade. On the other side of the road just past the school there was a small parade, opposite the entrance of Lee Chapel Lane, of three to four shops. Finally, a little further up the hill was the small thatched roof Post Office, near the Crown Hotel public house, completing the shops that were available to Laindon and Langdon Hills residents. Every thing that was needed could be bought at these establishments. The eastern end of Victoria Road at the crossroads where it met Railway Approach in common with Topsham and Merrylands plus numerous other roads, were typical of the roads in the more remote parts of Laindon and were known as the ‘back roads’. In winter, these roads were ‘no go’ areas for tradesmen’s vehicles, in particular, coal merchants, due to the impassable conditions. All these back roads were unmade, with isolated bungalows dotted here and there. In the late fifties and early sixties, starting with Devonshire Road, saw new social housing emerging from the chaos of the ‘back roads’. My brother Ray and I started at Langdon Hills School the day after we moved into the area. It was a long walk as there wasn’t a primary school any nearer to Victoria Road. Markham’s Chase and Laindon Park Schools were of a similar distance from where we lived. There were no other primary schools around at the time. We took the walk in our stride, as it had been a long trek to our previous school in Pitsea and we were by now used to walking almost everywhere we wanted to go. We didn’t have the luxury of cycles, except for the one that my father owned to get to work on. Sometimes my friend and I would walk what we called the back way to school. Along Railway Approach as far as the railway bridge, through to Berry Lane, then wander along the cinder path past the clinic to the bottom of the railway bridge at Florence Road and on to school or carry on through Berry Lane to Alexander Road and down to the High Road. Rob, my husband, who lived in Alexander Road, Langdon Hills, before moving to Devonshire Road, tells me that the canteen at the school used to be opened during the summer holidays and provided meals for some of the local children, ensuring that they got at least one hot meal a day. I wasn’t aware of this but we did live quite a distance from the school. On occasions we would go to what we knew as the ‘Second Rec’ at the bottom of New Avenue in Langdon Hills (the ‘First Recreation ground’ being close to where we lived in our prefab). There was a paddling pool at the Recreation Ground in Langdon Hills which we often used in the summer holidays. We both then moved on to Laindon High Road school, which was much closer. My mother took me to the Radion cinema (known as the flea pit) as a treat one evening and there was a terrific thunderstorm while we were there, the power failed so everybody had to leave the building. It was raining so heavily when we got outside that the drains couldn’t cope with the deluge and we had to paddle home through the water. Our doctors were Dr Long and Dr Garson, who had their surgery at the ‘Hiawatha’ on the corner of St Nicholas Lane and the High Road, opposite the Police Station. I believe Dr Garson emigrated (I think) to Canada. Opposite the surgery on the other corner of St Nicholas Lane was the hall (St Peter’s Hall) where I attended Girl Guides. The Memorial Hall was in the High Road, which was well used for dances, amateur shows etc. I remember I took part in a talent competition which was held there. I don’t recall whether this was a regular event or a one off. I stood on the stage and recited a poem called ‘In disgrace’. Needless to say, I didn’t win!! These are a few of the things that spring to mind when I think about the years that I spent in Laindon and I look back on these times with fond memories and a sadness that it is all so different now. However, things change and improvements are made, perhaps not always for the best. The way we live now, many things are taken for granted. We had few basic comforts in those far off days of my childhood. Just enough to eat was a luxury, never mind all the electronic gadgets that are a ‘must have’ for the children of the Twenty First century but if change and progress did not take us forward, we would still have the ‘back roads’ lit by the occasional gas lamp if you were lucky enough to have a gas main in your road! Hi Eric, just to let you know that I live in South Melbourne, having immigrated in 1964 to Fremantle and finally settling in Victoria. Keith sadly passed away suddenly aged 30 in 1978. At school I won the year history prize, PE prize among others and have managed to pursue my love of history for a living. My business The Collector Auctions keeps me very busy with no thoughts of retiring. Very fortunate to be doing something I love. Two weeks ago I took a trip down memory lane with my Aunt Una Kinnear (Richardson)and visited Laindon. Took a photo of 68 King Edward Road, visited Langdon Hill woods, Plotlands, St. Nicholas Church, Markham Chase school. Had a cuppa with my Aunt Eira Perchard (Richardson) then visited Coral Hewitt for lunch. A wonderful day. I really appreciate the effort put in by everyone and their memories. It means a lot to me living so far away as it probably does for you. Indeed a breakthrough on this site for Coral Hewitt to be mentioned yet again, this time by her husband, Ivor. Doesn’t it seem incredible that a girl at school could be remembered for her stunning looks 53 years later? I also hope that Coral will write a few words now that Ivor has written this week. Wouldn’t it be brilliant also if she could post a photo from those days just to bring back memories. Although I was too young to have been in Coral’s class I was in Vanessa Crew’s class all the way through Laindon High Road School, we even went up in the second year together to join Mr Rees’s top form U2A in 1959. So fascinating on this website to hear about schoolfriends from back in the day. Hi Ivor! So pleased to see we have a ”break-through” at last. Hope you are keeping well. Now you have appeared here on Laindon History site, what are the chances of you coaxing Coral to write a few lines (to start with anyway). You can see she would be made very welcome. Come on Coral – or maybe you could make the next meet at Laindon Library? I have read with interest all the posts on this site. I am the lucky man who married Coral Hewett. She is as lovely today as you have described her. My name is Ivor. Her mother was Gladys. Her father Barney was a great prankster and a loveable man who used to fight for the rights of people being compulsorily purchased by the Basildon Development Corporation. He made sure they always got a fair price. He never had a beard nor did he ever wear a hat. He was always smartly turned out and a credit to Laindon. It was interesting to hear from Nina Humphrey and it was something I didn’t know! We left “Springtime” around 1950 and moved to a prefab in Victoria Road, leaving this around 1953 to move to Wolverhampton. As Nina said, “Springtime” was owned by my grandmother, Grace Howard (née de Quincey) who moved there from London in the 1930s for the sake of her husband’s health, but he died soon after. I understand that “Springtime” was compulsorily purchased in the late 1950s and Grace moved into a pensioners bungalow. Sadly, Uncle Bobby died only a few days ago! Alvin. It is all falling into place now – it is such a small world. I now realise your mum was May Richardson, one of the sisters of my brother Dennis’s best mate Bobby Richardson. I recognise other names you mentioned – ‘Ginger’ Crew and ‘Barney’ Hewitt, who married two of Bobby’s other sisters. I believe there were 7 children in all, including two sets of twins. (Bobby and Pamela – Una and Eira). Dennis told me many stories about his and Bobby’s younger days – I know they both loved their motorbikes. It was no doubt through this connection that Dennis and Joyce found temporary accommodation at ‘Springtime’. The twins Una and Eira are the same age as my sister Anne. There’s an article on this site that I wrote about a reunion at Dunton Visitor Centre in August 2011 called “Dunton Reunion 6th August 2011”. The very last photo shows my sister Anne with her friend Sylvia Short meeting up with Una and Eira after 50 years. Quite an occasion! I was very sorry indeed to hear about your Uncle Bobby. Please accept my deepest condolences. I will pass the news onto Joyce and my sister Anne. Very best wishes. Alvin. I have just read that you once lived in Gloucester Road. Was the bungalow called ‘Springtime’. If so, you may recall my brother Dennis Burton and his wife Joyce who were lodgers there from around 1953 until 1955. Dennis and Bobby Richardson were the best of friends. Dennis and Joyce had a baby called Paul and I remember visiting them in ‘Springtime’ a few times, I was only 8 at the time. They were expecting a second baby and were on the council waiting list. Martin was born in January 1955 and they moved into a brand new house in Fonteyn Close on the Pound Lane estate at the end of March 1955. My brother died a couple of years ago but Joyce still lives in the same house in Fonteyn Close and occasionally recalls her time at ‘Springtime’ where she tells me her landlady’s name was Mrs Howard. Gooday Alvin I thought you were related to the Hewitt & Crew families. I remember you lived in Pound Lane a few doors from Arnie Frost. Is cousin Keith Crew still in Australia? It was a good surprise to get the response from Eric Pasco and a surprise to discover that he is in Australia! My parents Ernest and May Howard and myself emigrated to Australia in October 1963 along with my aunt Dorothy Crew, her husband Harry (Ginger) and children Keith and Vanessa. We all left on the M.V. Auralia from Southampton and travelled via the Suez Canal to Perth. After a short stay in a Hostel camp, we moved to Inglewood and the Crews moved to a house next to the city fire station. I went to Mt. Lawley High School and my father worked on the construction of Perth’s first real television station. By May 1964 the Howard group were back in England and thanks to Barney Hewitt’s generous help, we were soon settled in a council house in Great Knightleys. The Crew family moved west and sadly Keith died and I think that his mother developed cancer and died, followed by his father. Vanessa is now running an internet antiques business, I think in Adelaide, but I have lost the link. I married whilst still at School of Architecture and my father died of cancer about a month later, my mother dying only a few years ago. Sadly my direct links with Laindon ceased when I moved to Wiltshire in 1973. I do find this website very evocative and am searching the recesses of my mind and the attic for memories and pictures which I will forward as they arise. Some updates are that Coral Hewitt is living close to Basildon and her brother Gareth has flat in the town. Uncle Bobby (Robert) Richardson moved with his wife and two children, to South Africa, then Southern Rhodesia, but seeing the troubles to come returned to England shortly and moved on to Canada and then Alabama (I think Birmingham), where he set up an Engineering business, dying some years later. Una Richardson divorced her ex marine/tanker driver and married a builder/developer and lives on the Essex/Suffolk borders. Pamela Richardson married Raymond York from the Midlands (I have a very early memory of uncle Ray giving me a ride on the fuel tank of his motor cycle along the unmade track that was Devonshire Road to Rosedean, the Richardson Family house. It was so uncomfortable, I haven’t sat on a motor bike since! Ira Richardson married Robert Perchard (I think) who was a sculptor of clay prototypes at Fords. Perhaps these little items of history will generate some more cross conversations and memories. I’ve enjoyed the memories around the Hewitts and can confirm that Barney Hewitt was indeed a smart dresser, for I am the son of May Howard (née Richardson) and his nephew and he would never have driven a “beat up” car. In the early sixties he had a very smart, white and red Ford (Zephyr?) convertible, which was written off in the East End of London with me as a passenger passing with very little ill effect, through the windscreen. After that he had a white Mk2 Jaguar. Someone wanted to know the estate agent’s name and it was the Ideal Home Estate Agency. He also owned the electrical shop next door and I can remember the hazardous business of charging the accumulators brought in by residents who still did not have mains electricity. This was true for my familly, who started in Gloucester Road with paraffin lamps and a well until the early 1950s. In fact, when the well ran dry in the summer, my carpenter father, whilst cycling to work would stop at the fire station and make a “small donation”, which would result in the fire engine driving up the unmade road and discharging its tank into the well! We soon moved into a two bedroomed prefab in Victoria Road, about halfway along the park and this building had two profound effects on me. One was its interesting construction, which probably inspired me to become an architect and the other was the grid frame of timber by the front door, which was good for a 3-4 year old to climb and I spent many happy hours on the flat roof and later developed a passion for climbing (but in the Lake District as a result of trips organised by Arthur Burch(?) the geography teacher from LHR). Curiously I spent part of the year between O and A levels working for Essex Stonecrafts in Wickford, who designed and built office/school prefabs, using materials re-cycled from the very prefabs of Laindon. I noticed the lady Joy mentions her brother was Raymond Dean funny he was in most of my classes at Langdon Hills Primary School and the Laindon High Road School. I wonder if it’s the same Ray he, if it is he must remember me. Hello again. I forgot to say there is a photo of the twins Una and Eira Richardson in my article under ‘History in the Making’ called “Dunton reunion 6th August 2011”. It’s the very last photo. Una is on the left. As we lived next door to Barney Hewitt in the prefab, his wife’s name I am almost sure was Gladys, someone will soon tell me if I am wrong, but I am sure that was her name. Thank you John for confirming for me that Barney had an estate agents my memory can play tricks sometimes. That’s it! Coral’s mum’s name was Gladys. Further to Richard Haines. His description of Barney Hewitt does not co-incide with mine, as I remember a very sharp dresser with curly hair and I cannot remember him as ever having a beard or wearing a cap, quite unlike his sister Daisy whose mode of dress could be called bohemian. The Richardson girls were all striking blondes, the youngest was Una who I believe married an oil tanker driver, then Dolly who married Ginger Crew and I believe is Vanessa Crew’s mother and the eldest, whose name escapes me for the moment married Barney and was I believe the mother of Coral. If I am mistaken, I apologise for any offence given. Bill, thanks, this confirms then that the 1960 driver was not Barney. I think when Coral gets on to this site all will be made clear, so with respect, we should not guess any further. I’ve asked Ray Cuttler to scan in his 4th year photo and if he does send it on I will post it on here. On a happy note then, no doubt, they were all stunners, Una, Dolly, Vanessa and of course Coral. Happy days. Hi there. Regarding the Richardson family, I believe the oldest daughter was Gladys. Then came Dorothy, then May, then twins Pamela and Robert, and another set of twins Una and Eira. Robert (Bobby) was my brother Dennis’ best friend. I hope this helps. When the Basildon Development Corporation set about compulsorily purchasing properties in the Laindon area, Barney Hewitt opened an estate agency in a lock up shop in High Road, Langdon Hills just to the south of Cottis’s bakery. Among others, he handled the disposal, for demolition, of the dwelling I and my family occupied and our re-housing in Lee Chapel South. Perhaps more memorable than Barney was his sister whose name I forget. It would be fair to describe her as a buxom lass who, during the war, had been recruited to the Women’s Land Army. To see the local contingent of WLA girls on the back of a lorry en-route to work somewhere in the district was to see and admire a bunch of determined women with Barney’s sister just like Queen Boudicea at their head. This was particularly true as she had long disdained the wearing of anything as namby pamby as a brassiere under her green woollen jersey! The last I heard she was living in Sparrows Hearne, Basildon. The Hewitts were always a colourful crowd. Ok, John – was Barney a dark haired bloke with a bit of a beard and sometimes wearing glasses, maybe a hat or cap, driving a beat up Morris -perhaps a prewar one? or did Coral have a personal driver in those days. I envy you seeing the land girls, before my time – but I’m sure very memorable. A typical Coral outfit would have been a tight pink skirt, tight blouse and heeled shoes, dazzling blonde hair, our own Laindon star. By the way, can you direct me to Sparrows Hearne? More on Coral for all her fans. If you go to friendsreunited for the year 1960 at LHR, Ray Cuttler has posted a photo of Frank Foremans class of that year with our babe sitting in the front row. She looks a bit more demurely dressed than usual but still fantastic looking. As I suspected I would have been a second year boy, about 13 then, Coral and the rest 15, in their 4th year. Frank Foreman was a terrific young teacher and as can be seen, sported the in vogue look of the time. I remember Coral Hewitt, the good looker of LHR. She used to get dropped off every lunchtime by, I presume, her dad who drove a beat up old car. I used to time my return walk to school after lunch to coincide with Corals trip just to look. I think she had a brother called Gareth as well. Both good looking blonde Laindoners. Seems funny to think she is now retired!! very happy times. I too remember Coral Hewitt and her brother Gareth who was in my class at LHR. He was the first to wear Cuban heel boots to school (the things we remember!!). Vanessa Crew was related to them and Keith Crew was in my year at LHR. They did come to Australia but do not know if they are still here. Also I think Alvin Howard was also related to the Hewitt & Crew families. William you may well be right on Barney Hewitt as I was under 5 when we lived in the prefab. I just recall he had something to do with housing and they later moved to Basildon. Their son had a sports car and I recall he had some kind of accident but I am not to clear. For Richard – a bit of useless info for anyone else, but for you, Coral still looks good! She is married to Alvar (think that’s his name). My other half Chris has vivid memories of her driving skills! She bought a Triumph Mayflower when she passed her test and took him and friends out for a ride – he said Ernie Hawkins was shouting STOP, I want to get out and Chris said he was relieved to get out even though she found it all very funny! Apparently her driving skills weren’t that great. Next time Coral and I meet, I will mention this site. I have a slight confusion in respect of the Hewitt Family which Andrea as she is familiar with Coral Hewitt might be able to enlighten me. While I knew Barney quite well I always believed he married the elder of the three Richardson girls. If so, Dolly the next eldest married ‘Ginger’ Crew who emigrated to Australia in 1964 and I believe it was their daughter Vanessa Crew who so very recently wrote in these pages staing her two aunts still lived in Laindon, yet Andrea states that Coral’s mother was deceased and that I was mistaken in believing that Barney had married a Richardson girl. I remember Daisy Hewitt, although I was never in her company and always thought she was totally unlike her brother who was a regular patron of the Essex Country Club together with Ginger Crew and the Richardson girls. Eric, yes Gareth may have been the first to get cuban heeled boots but I was the first to get maroon ones. In the final year I had the mohair jumper, striped blazer, the boots and all. Oh and black skinny jeans which got soaked in petrol at my after-school job at the Regent garage. Going back to Coral she was in a year or two above me at LHR but she was a total one-off as far as looks and clothes went. A legend. Gloria, I guess you are right, Fred and I had the best girlfriends ever in Pam and Lin. At present I cannot recall Coral’s mum’s name although I can see her clearly – a smart blonde lady. I will certainly ask Coral when I see her again and let you know. Hopefully I will be able to get her to contribute to this site too. Further to the Gloria Sewell comment, 06/07/11, in respect of this page, she asks about “Barney” Hewitt her one time neighbour. I remember Barney and while I am not too sure of his being an estate agent, he did become quite well known as an advocate for families in dispute with the Basildon Developement Corporation in respect of the valuation of theiir properties during the era of compulsory purchase. He did at one time emigrate to Australia but this was shortlived and he returned to Laindon. Strangely enough, I did read in these pages of a letter from Australia in respect of the High Rd. school by a Vanesa Crew who spoke of her two aunts still living here and I believe the elder of the two was married to Barney Hewitt. It is strange how links with Laindon people seem to be intertwined. From time to time, I have seen Coral Hewitt (Barney’s daughter), the last time we stopped and chatted was in Tesco at Pitsea. Both parents are now deceased but Coral is instantly recognisable – not so long ago she retired from her Travel Agent shop in Pitsea. Does anyone remember Daisy Hewitt who rode about Laindon on a motorbike? 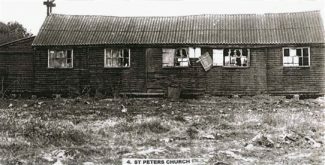 Sorry Janet Gadd, the picture was of St.Peters Church Hall opposite the Hiawatha on the junction of St.Nicholas Lane and the High Rd. The St. Nicholas Hall was from pre-war days a brick, or faced breeze construction located at the bottom of the hill near to Pound Lane. 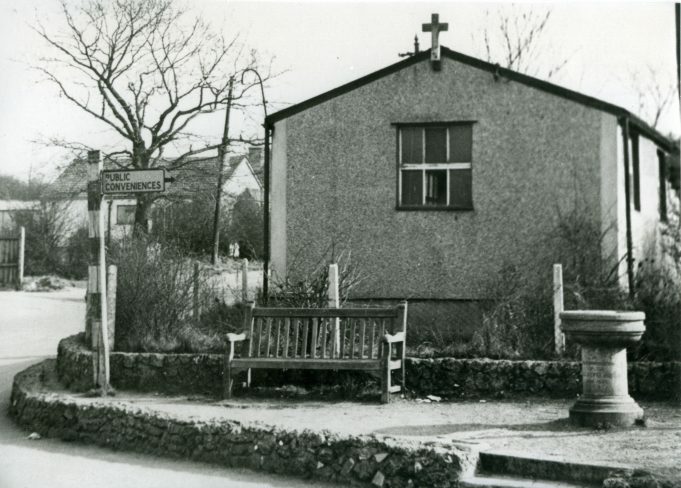 It was lovely to see a picture of St Nicolas Church hall I used to go there to Sunday School when I was very young and not old enough to go to the Sunday School in the church opposite. As you say I can remember the hall being hired for parties and jumble sales. I clearly remember we did not have a street party for the Queens Coronation, I don’t remember why perhaps it was because we lived at the bottom of King Edward Road and it was the only vehicular access to the estate, and so we had our celebratory party there instead. 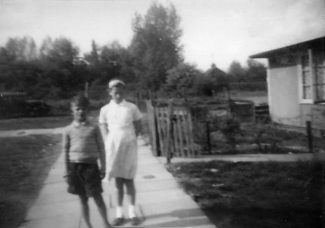 I lived in a prefab approx 1945-1948 I recall loving living there, our playground in the middle where my dad kept his horse. Our neighbours were the Hewitt family who had a local estate agents, Mr Hewitt’s name was Barney can any one remember the estate agent? Mr Smith lived opposite us in an older bungalow she was a very kindly old lady. We lived in Worthing Road mum, dad and little brother Fred. We also had an Alsatian dog we got from Mr Farmer (taxis), can’t remember if they bred them or if it was a one off. I recall Beryl Farmer being first local lady taxi driver. During the 50’s, Mr Tom Williams (a school teacher) and his family lived in the last prefab in Railway Approach (corner of Worthing Road). We lived at the other end of Railway App. I lived in one of the prefabs, it was on the corner of Worthing Road and Railway Approach. I can’t remember the number. It still has the phone box on the corner where our place was. What a lovely picture Joy has painted. More photos please. Excellent, I lived in Worthing Road from 65 on. I am sure you recall Trevor and Paul on the old manor park? I don’t remember them but I am sure that many others will.